Stages are short (for now i've reached stage 4) and the graphics is more or less the same. It's a shame because it could be really a big game.. I like the graphics style. Reminds me a bit of Laydock graphics wise, but it has a new feel to it. Also the weapons are pretty nice and the weapon system also seems interesting and unlike anything else. Some things are quite impressive on it, if you ask me, especially for that time. I discovered this thread and this game just right now. I'm a little happy. 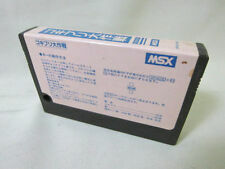 Good MSX2.